Porter began his musical career as a teenager in the early 60s under the stage-name "Rob E.G.". The young steel guitar prodigy recorded a string of successful instrumental singles for Festival Records, beginning in 1959, although he had a setback when he suffered serious spinal injuries in a car accident in 1961. He appeared regularly on TV and hosted his own show, Surf Sound. He very successful, scoring four top ten singles in the early Sixties, including two #1 hits with Si Senor and 55 Days At Peking. In 1964 Porter took the advice of Beatles manager Brian Epstein and went to the UK, then moved on to the USA, where he continued to write and record. While in the US he also made several TV appearances. He had a role the short-lived 1967 beach party series Malibu U., starring Ricky Nelson, performed in the 1967 TV special Popendity hosted by Flip Wilson and featuring Neil Diamond, Buffalo Springfield and Aretha Franklin, and appeared in Daniel Boone, Mannix, The Immortal. He co-starred opposite Sam Waterson and Charlotte Rampling in the movie Three in 1969 and also featured in the 1972 mystery movie The Carey Treatment, directed by Blake Edwards. It is presumably at this time that porter came into contact with American writer-producer-director Steve Binder, who became his business partner a few years later, and whose TV credits include Hullabaloo, The TAMI Special and Elvis's 1968 Comeback Special. Porter returned to Australia in 1970 and bought a controlling share of the independent record label Sparmac, which had been established (as the name suggests) by Melbourne DJ Ken Sparkes, and John MacDonald. He released three solo singles on Sparmac -- Gemini /He is Not Me (August 1970), Santa Claus / Funky Version (December 1970) and a cover of the Joe Cocker/Chris Stainton song Try to Find More Love (There Must be a Reason) / Empty (March 1971). In May 1970 porter saw Daddy Cool at a gig in Melbourne and signed them to Sparmac with tremendous success. He produced all three of their LPs and all their singles, including Eagle Rock. He also produced the classic 1971 single Golden Miles for Healing Force. In 1973 he set up a new label, Wizard in partnership with Steve Binder, and the pair also became the co-managers of former Zoot guitarist Rick Springfield and helped to launch his career in the United States. 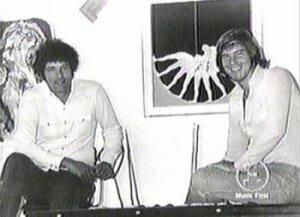 Steve Binder (left) and Robie Porter in the early 70s. The first Wizard release was the album by Daddy Cool's successor, Mighty Kong. Porter produced more successful records in the '70s including three albums for Springfield and hit singles and albums for Hush and Marcia Hines, including Marcia's signature tune Shining, which Porter co-wrote for her. By the mid-70s serious tensions had evidently developed between Porter and his artists. A second Mighty Kong album was aborted after a contractual dispute between Porter and the band, and both Ross Wilson and Marcia Hines fell out with Porter and were obliged to wait for the expiration of their respective contracts before continuing their recording careers on other labels. In 1979 Porter composed the theme song for the telemovie Some Kind Of Miracle. He had huge success in the '80's producing the breakthrough Air Supply album and single Lost In Love, three albums for guitarist Tommy Emmanuel, an album for The Nauts (formerly Supernaut), and a mini-LP for Gerry & The Joy Band, fronted by former Loved One Gerry Humphreys. Porter is now based in the USA, where works in television production and is a successful horse breeder. More information about Robie Porter?